There are many smartphones in the market. The market is flooded with numerous models from different companies. Hence for a buyer, it is difficult to decide for what model one should go. There are different companies from different corners, and some of the companies are known for their models in the market due to which they have got significant market share. There are lots of features which make the brand special and different brands focus one such feature. One of such brands is LG. It has been a known brand in various appliances but at the same time company preferred to venture into the mobile market and hence it started the production of the same. LG is a South Korean Multinational firm which is known for its consumer electronic goods. It has a huge market share across the globe for consumer electronic devices such as TV set, Air conditioner, Laptops, Computers, Washing Machines and the likes. A few years ago, the brand ventured into the Smartphone business. From 2013, LG has been coming up with some of the finest phones which are technologically updated and have attractive looks. The brand has given a tough fight to brands like Samsung, Moto, Oppo, and Gionee. The V and G series from LG has been one of the most popular series with brilliant devices. This time across LG is planning to venture in the niche segment with LG V30 which is expected to hit the Indian markets in August. The LG V30 is packed with splendid looks. It flaunts a huge 6.2-inch screen with IPS LCD and capacitive touchscreen which responds quite well to multi-touch. The phone offers a screen resolution of 1440 x 2560 pixels with 474 ppi. The device comes with a Corning Gorilla Glass v5 which offers optimum protection from screen breakage. Those who love to have big screen mobile can go for this device. The screen resolution and LCD are the excellent features that one may love to operate the device. The LG V30 comes with powerful software which packs a Qualcomm Snapdragon 835 MSM8998 chipsets along with an Octa-core 2.45 GHz, Quad-core, Kryo + 1.9 GHz, Quad-core, Kryo processor. The phone offers a 4GB RAM which offers smooth functioning and prevents the phone from hanging. With the help of the 4GB RAM and effective processors, one can carry out various applications at the same moment. These days the device with a low camera or no camera is not considered as a device at all. Hence for the camera lovers,this model is a perfect one. The Camera of LG V30 is yet another remarkable feature of the device. The phone is equipped with 13MP + 13MP dual primary camera with a host of features like autofocus, laser autofocus, optical image stabilization and phase detection autofocus along with LED flash. It offers an image resolution of 4128 x 3096 pixels. The device comes with an equally amazing front camera with 8MP which clicks amazing selfies and videos. One can capture amazing images with the help of the G V30. The LG V30 performs impeccably on the storage and battery front. The phone is packed with a whopping 64 GB of internal memory which is the best in its segment. The expandable memory of the device is yet another outstanding feature of the device. The device offers an external memory of 2TB. This is the device that has got the highest storage capacity with the help of the SD card. One can store not only ample songs, images, video clips or files but also movies that can help one enjoy every moment with the model. The LG V30 is powered by a 3500 mAh Li-ion non-removable battery which is said to offer quick charging and long endurance. Hence those who need to use mobile for a long time and does not get sufficient time for charging, this device can prove much helpful. The LG V30 offers dual-SIM connectivity with Nano SIM slots for both the SIM cards. The device supports 2G, 3G, 4G, and EDGE along with GPRS. Among the connectivity options, one can find Wi-Fi, Bluetooth, mobile hotspot, GPS, USB port type-c and NFC. The device is equipped with a rear-mounted fingerprint sensor, light sensor, gyroscope and compass along with barometer and proximity sensor. Hence there is no problem for those who need to exchange files. The price of LG V30 is estimated to be around Rs60000. The device gets its positioning in the higher end among the likes of Apple and Samsung. 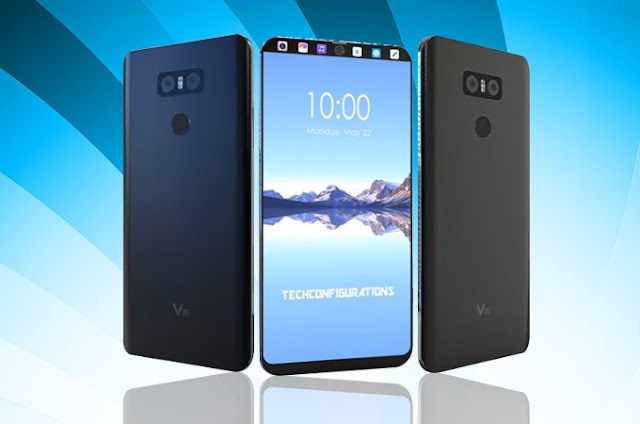 The LG V30 is definitely an ambitious launch for the brand as it is the very first phone by the brand which is going to directly compete with high-end Samsung devices along with the much in vogue Apple phones. This brings the obvious threat for the LG V30, but the device seems promising enough to withstand the competition. The powerful battery, excellent camera, and great configuration are the major plus points of the device. Even the display of the phone is a remarkable feature. As far as the performance of the device is concerned, one will have to wait as the device has not been launched yet. For any mobile related query 91 mobiles is the one stop solution. The portal offers authentic information about the features and specifications of each and every device which has been launched or yet to be launched. Apart from that it also offers price comparison which helps the buyer in making a decision. The reviews offered by the site are genuine and has a balance of plus and minus points for a clear idea about any device. One can find the details of almost all the devices by each brand on the portal.